Spink Cup Holder protects your computer from spills: "
Whenever you’re really into what you’re doing, it seems like that’s the moment you forget about that hot cup of coffee that’s conveniently placed just a little too close to an elbow. Of course this always happens around sensitive material like important paperwork and electronics. If you were to pick up Spink it’ll keep your drinks from spilling when you happen to knock into them. This is probably the most simple yet brilliant device. You already use cup holders in your car, so you might as well have one for your desk as well. 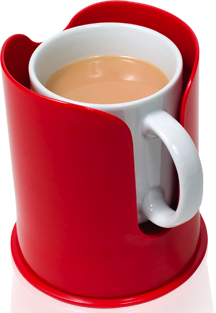 This allows for your glass or coffee cup to just slip inside. Then underneath is a strong lever-powered suction that won’t let the holder be tipped over. With Spink you can not only choose between red, black or white, but you can also customize it by slipping in a photograph. You can purchase one of these for $19.95 online or find a store that sells Dreamfarm products. SEEMS LIKE YOU NEED TO DOCK YOU CUP WITH WITH HOLDER RATHER PRECISELY. IN A HURRY IT MIGHT CAUSE A SPILL. I THINK THERE IS A SCIENTIFIC PAPER IN KEYBOARD/FLUID MAGNETISM. I'D WRITE ONE, BUT IF I DID I'D SHORT OUT MY KEYBOARD BY SPILLING TEA INTO IT.